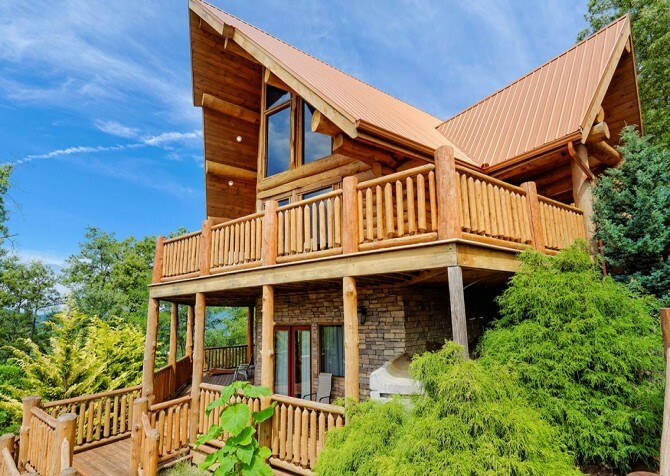 You’ll think you’re stepping onto the pages of a magazine when you walk up to Paul Bunyan’s Treehouse, a stunning all-log cabin rental less than 10 miles from downtown Pigeon Forge. The angled roof, wraparound deck, and stacked stone exterior immediately give this rental property a luxurious appeal. 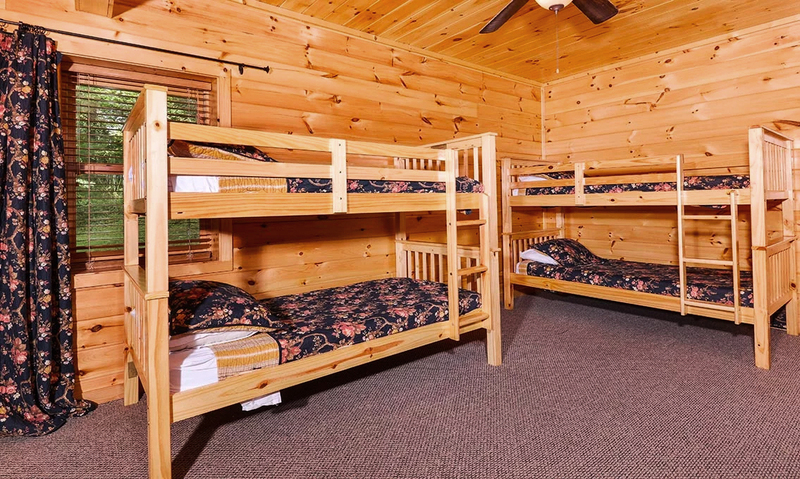 Inside Paul Bunyan’s Treehouse, you’ll be just as wowed by the spacious and warmly accented interior, complete with multiple sitting areas, a rec space, 4 bedrooms, and 3 ½ bathrooms. This Pigeon Forge cabin was designed with small group getaways of up to 12 guests in mind. 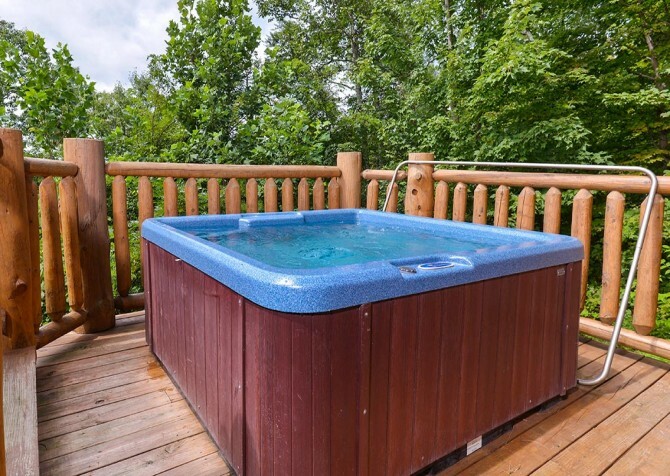 You can make this your ideal destination for a family get-together during the holidays, a couples’ getaway when the leaves are changing in the fall, or a vacation with friends at the peak of summer. No matter what time of year you visit, Paul Bunyan’s Treehouse offers impeccable views of the Smoky Mountain trees and rolling mountains beyond. And you’ll have plenty of options for group entertainment, including the community pool and tennis courts inside the gated Shagbark Resort. 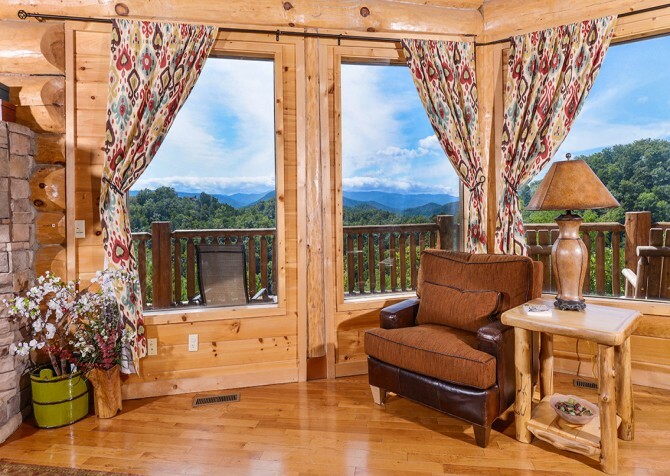 If you’re looking for a secluded cabin where you can escape in the Smokies, don’t miss Paul Bunyan’s Treehouse! 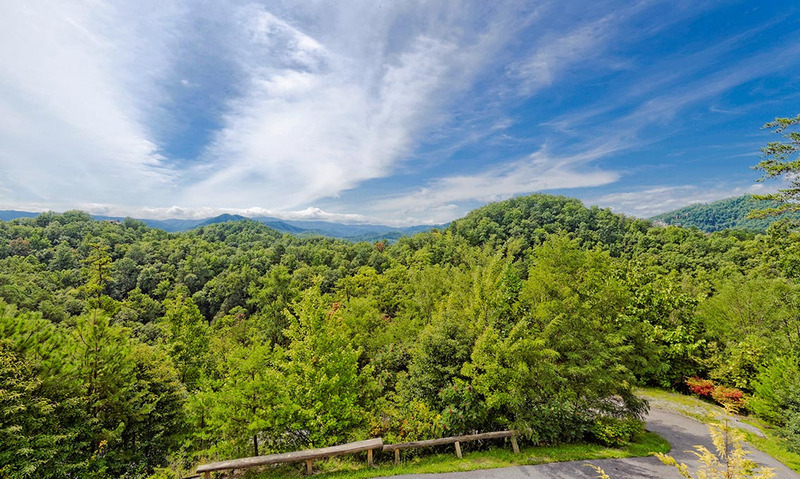 One of the more popular ways to experience the grandeur of the Smoky Mountains is to soar above it all on a zipline tour or ropes course adventure. 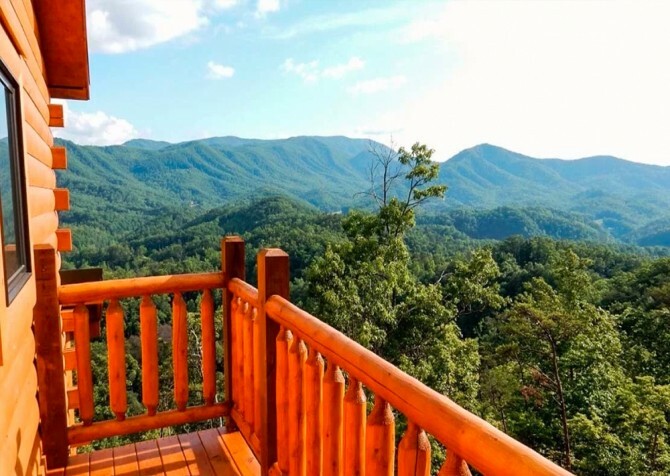 But the great thing about staying at a Pigeon Forge cabin like Paul Bunyan’s Treehouse is you don’t have to leave your living room to see miles of Smoky Mountain scenery—from the lush green forests to the rolling blue hills! This is because the spacious living room inside Paul Bunyan’s Treehouse features an entire wall of oversized windows. Simply pull back the drapes and let the natural light flow in—you’ll love snuggling up in front of this view. And to provide you with comfortable places to kick back and relax, this all-log cabin offers a huge leather sectional with room that can fit nearly half of your 12-person party. There’s also a plush chair in the corner next to an end table and reading lamp. Curl up with a new book, spread a deck of cards on the coffee table, or play a favorite TV show on the flatscreen above the stone gas fireplace. 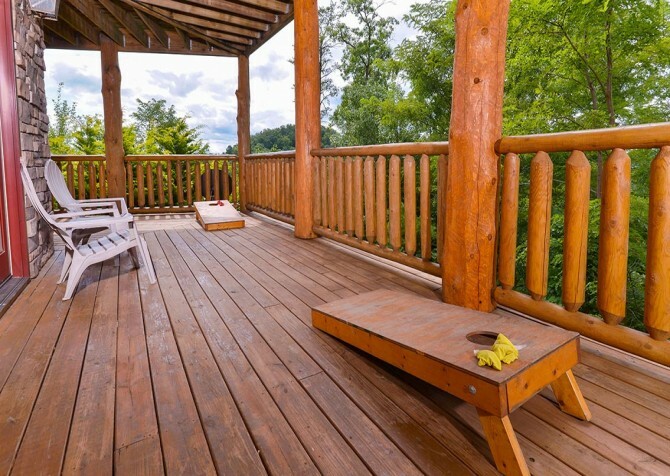 For those planning a holiday get-together in the Smokies or a private retreat where you’ll be spending a lot of time in the cabin, Paul Bunyan’s Treehouse is a great match for you. 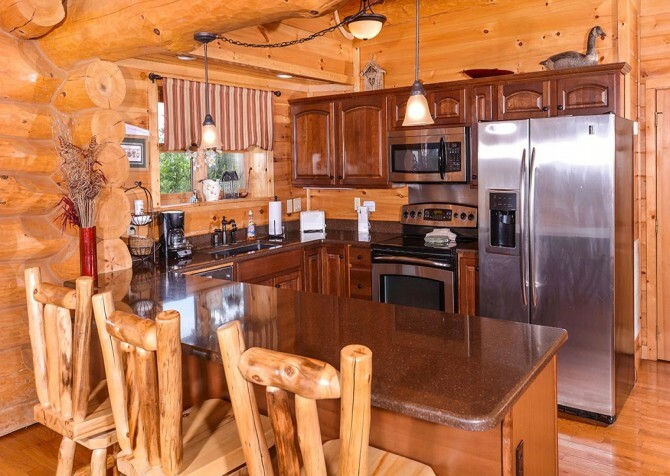 Simply use your full-size kitchen to make delicious homemade meals throughout your stay. You’ll have access to all major appliances in an upgraded stainless steel finish, including an ice machine. Use the oven to bake a tray of biscuits in the morning. Then smear on some fresh apple butter from The Apple Barn General Store in Sevierville, and you’ll have a mouthwatering breakfast for 12. Use the fridge to store deli meats, cheeses, and fresh tomatoes from the Wears Valley Farmers Market—a great option for lunch or a picnic in the Great Smoky Mountains National Park. Finally, take advantage of the ample counter space to spread out meats and sides for a buffet-style dinner. You’ll save yourself money, gas, and the headache of waiting in lines by eating in at Paul Bunyan’s Treehouse! Looking for a place to enjoy your homemade dinners? No problem! 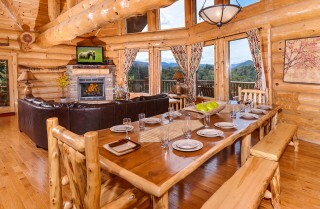 Paul Bunyan’s Treehouse offers a large dining table with place settings for 14, which means everyone in your group can eat together in a comfortable, cozy space. 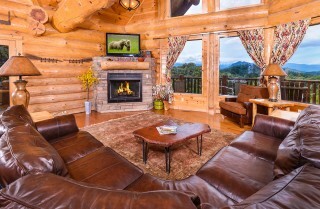 This log-style table matches the décor of the cabin with 2 log chairs and 4 log benches. 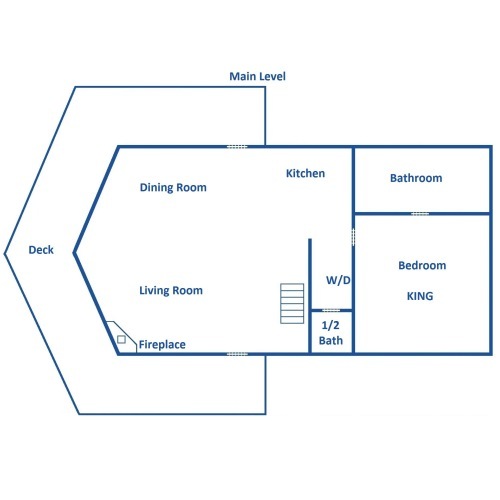 For extra seating—in case you want to spread out or separate the adults from the kids—check out the breakfast bar and stools attached to the kitchen. There’s also a large patio table with room for nearly your entire group if the weather is nice and you want to eat outside. 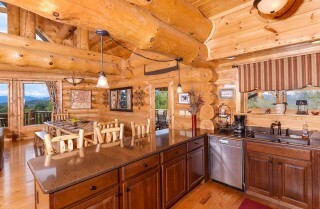 You’ll have plenty of dining options, providing intimacy and amazing views, at this Pigeon Forge cabin. 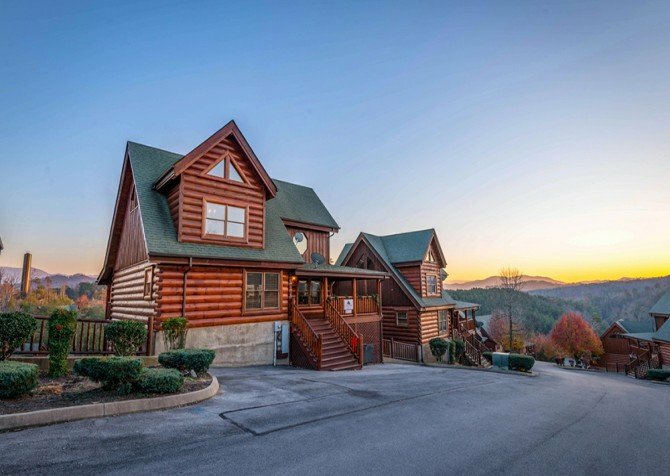 Although there are plenty of places to play in nearby Pigeon Forge—including a variety of arcades like the Big Top Arcade, Arcade City, and Rockin’ Raceway—Paul Bunyan’s Treehouse doesn’t disappoint when it comes to entertaining additions. 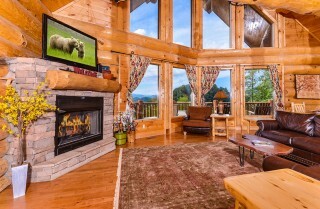 This modern mountain cabin comes with a pool table, so you can play and shoot around on lazy days. 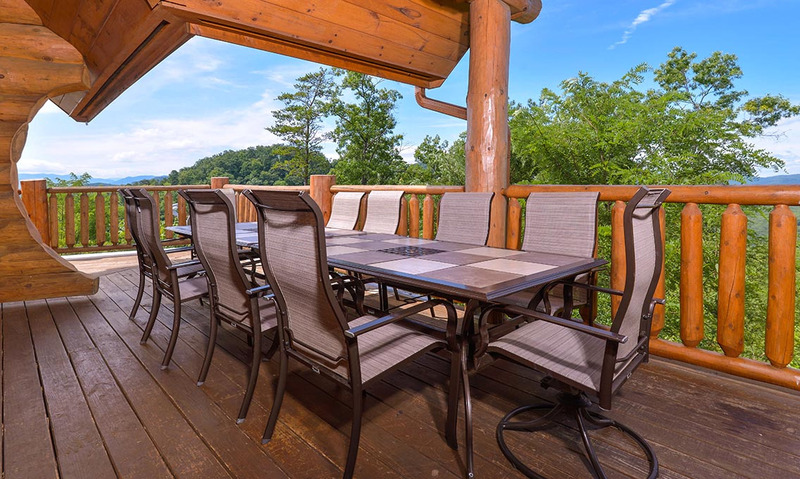 The rec space also offers direct porch access and is surrounded by large windows with incredible mountain and wooded views. 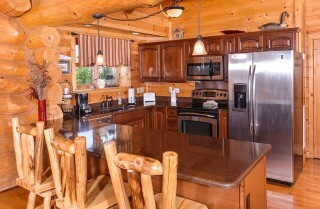 Plan to spend some downtime at the cabin when you book your stay at Paul Bunyan’s Treehouse! 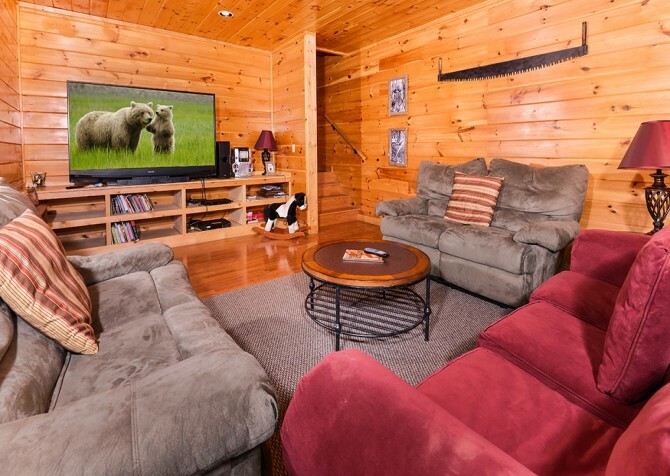 If the adults are watching one show and the kids want to watch something else, there’s no need to start an argument in this accommodating cabin. Paul Bunyan’s Treehouse comes with a separate home theater space, similar to a den, where the kids, the guys, or the group can watch a DVD, play a VHS tape, watch a show on DVR, or listen to music on the CD player. This space offers 3 comfortable couches where you can sit back and relax, and there’s a round coffee table in the center—perfect for a bowl of popcorn and some cold drinks. When you’re back from visiting the Fourth of July Parade, one of the popular summertime events in the Smokies, or from sledding down the mountain at Ober Gatlinburg during your wintertime escape, Paul Bunyan’s Treehouse offers you several spectacular options for catching some much-needed ZZZs. 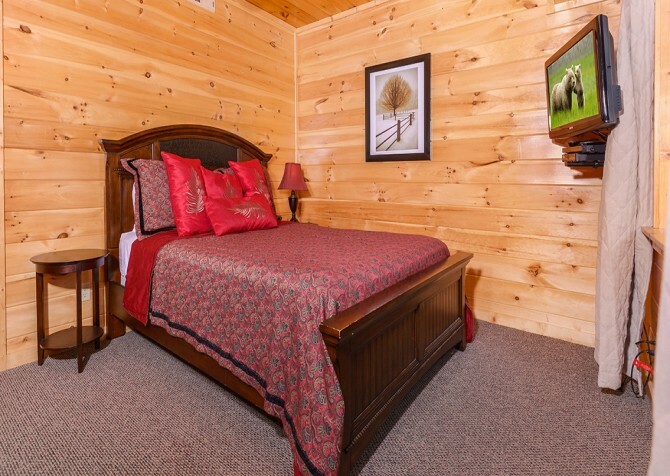 This cabin features 4 bedrooms total, providing comfortable accommodations for 12. The master suite is located on the top floor of the cabin and comes with a log-style king-size bed, a private bathroom with its own jetted tub and walk-in shower, a large walk-in closet, and a private balcony overlooking the Smokies. 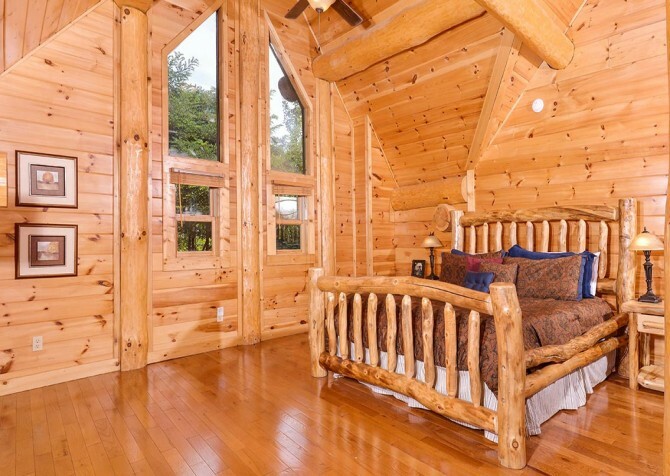 But this isn’t the only room that will impress you inside Paul Bunyan’s Treehouse. 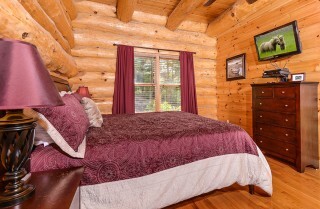 Another king-size bedroom can be found on the main floor. 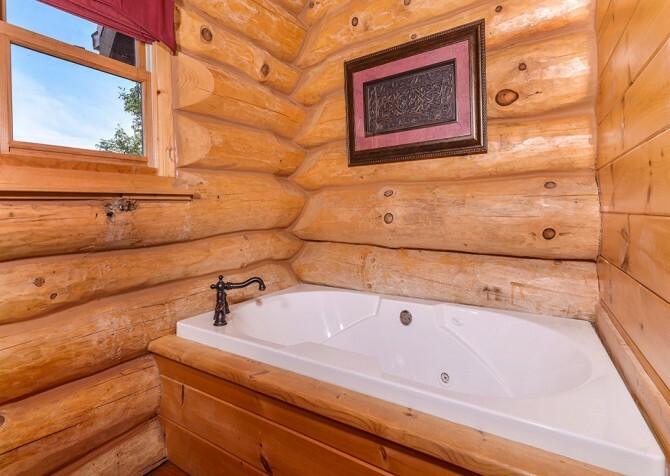 This room also features a walk-in closet, jetted tub, and walk-in shower. 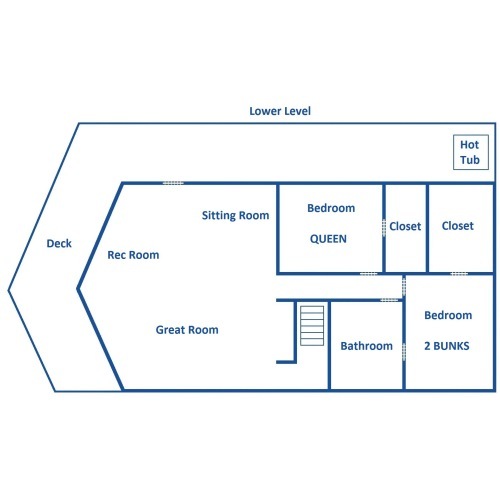 And on the lower level, you’ll find a queen-size bed in a private bedroom as well as a bunk room for the kids. These bedrooms share a large bathroom with a double sink and shower/bathtub combo. Every bedroom is beautifully furnished with modern décor and outfitted with its own flatscreen TV. Say hello to impressive mountain views when you book your stay at Paul Bunyan’s Treehouse! The position of this cabin—perched above the trees and overlooking the rolling blue hills in the distance—is one you simply can’t duplicate by staying in a hotel in downtown Pigeon Forge. 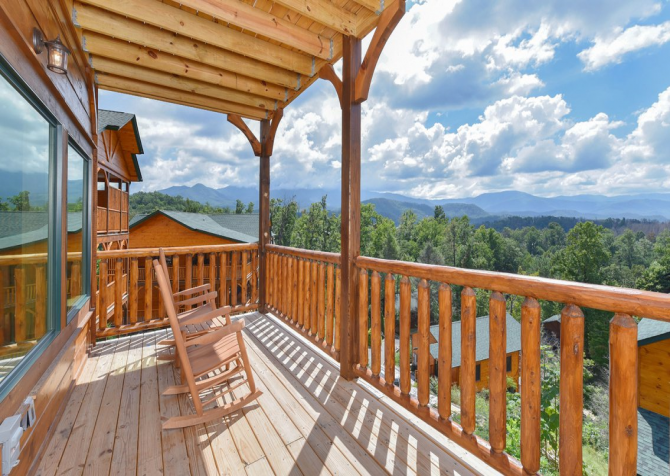 This cabin offers panoramic mountain views right from your very own wraparound porch. 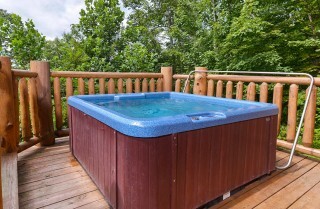 You’ll also have rocking chairs, a large patio table, and an outdoor hot tub to enjoy them from. If you’re into grilling, be sure to take advantage of the stainless steel gas grill that comes with Paul Bunyan’s Treehouse. For other outdoor excitement, play a game of corn hole on the spacious, covered deck. 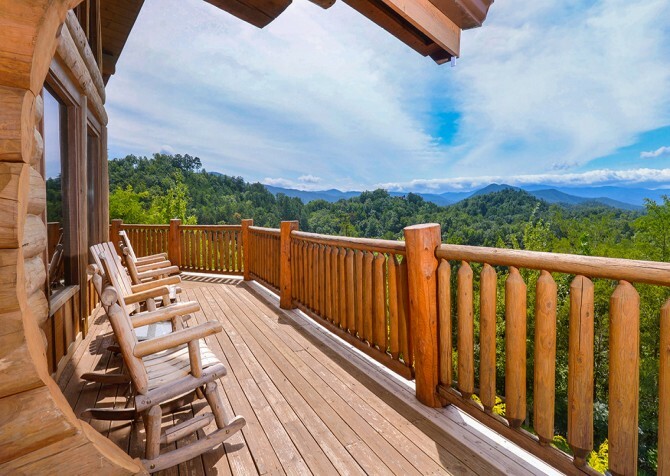 Paul Bunyan’s Treehouse is located in the Shagbark Resort, a private gated community in the rolling foothills of the Smoky Mountains. By staying inside the resort, you’ll have access to so much more than your cabin provides. In the late spring and summer, be sure to visit the outdoor community pool, and all year long you are invited to play a game of tennis with friends and family on the community courts. Inside Paul Bunyan’s Treehouse, a few of the amenities we haven’t listed already include high speed internet access, which will come in handy when you’re researching upcoming events and popular attractions in Pigeon Forge. 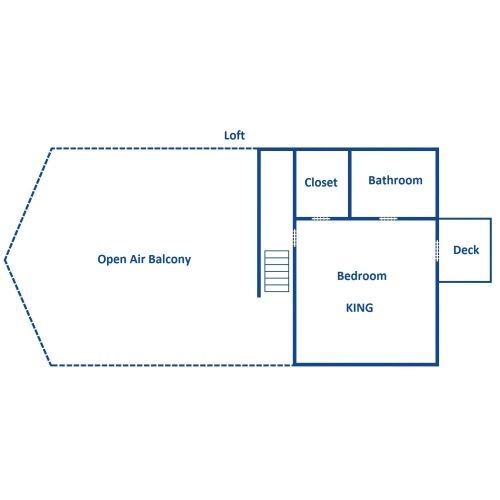 You’ll also have convenient additions like washer/dryer access and paved parking. 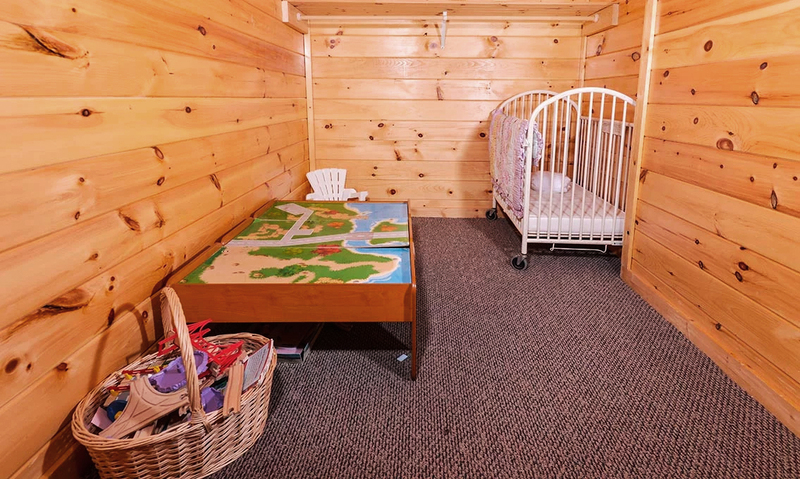 And for any families traveling with infants or toddlers, you’ll be happy to know that Paul Bunyan’s Treehouse offers a space for the baby, complete with a train table, kid’s chair, and crib. You can leave your port-a-crib at home on this family vacation! If you want to get the kids away from their devices for a little while, just bring them to WonderWorks, where learning has never been more fun! 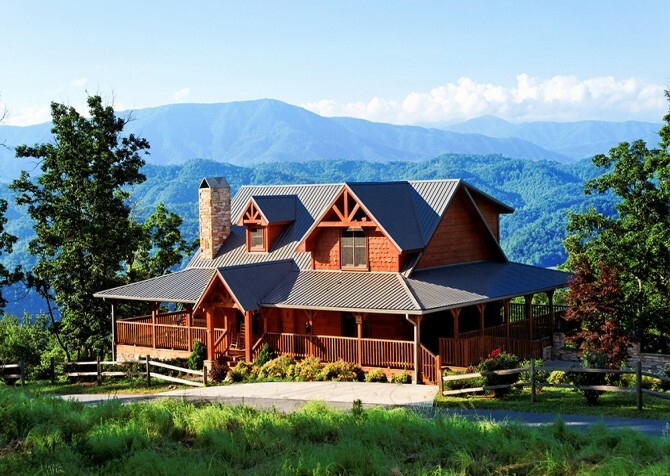 Known as “America’s Ultimate Variety Show,” the Smoky Mountain Opry is a great place for kids and adults alike. This exciting show features singers, dancers, comedians, magicians, and more! For a New Zealand adventure in the heart of Pigeon Forge, head to the Outdoor Gravity Park, where you’ll roll down a 1,000-foot hill in a giant bouncy ball! "When we got there it was easy to find. We had to explore every room. Our first evening out in the balcony was amazing. The view was spectacular. We ate every breakfast at the cabin. The kitchen was fully stocked and we enjoyed the family time around the outside table. Every night we ate dinner over looking the valley. It was close to all the attractions in both Pigeon Forge and Gatlinburg. We are planning a return trip next year. I’ve even recommended you to several friends and family members.…"
"When we got there it was easy to find. We had to explore every room. Our first evening out in the balcony was amazing. The view was spectacular. We ate every breakfast at the cabin. The kitchen was fully stocked and we enjoyed the family time around the outside table. Every night we ate dinner over looking the valley. It was close to all the attractions in both Pigeon Forge and Gatlinburg. We are planning a return trip next year. I’ve even recommended you to several friends and family members. It was the best."